It’s stories, the psychologist Barbara-Anne Wren reminds us, “that will hold us when nothing else can”. They are humankind’s most effective way of making sense of the world – of organising and giving “a shape to experience”. The organisation in question, both in the title and at the heart of the book, is the National Health Service (NHS): a gargantuan body employing around two million people. The individuals, working within the service in these straitened times, are facing unprecedented challenges. Relentless waves of financial cuts, along with breathtakingly costly systems of regulation and inspection, have left a workforce more disillusioned and more demoralised than ever before. Wren’s work as a psychologist and organisational consultant, in a busy London teaching hospital over the past seven years, has been ground-breaking. Rather than seeking the impossible, of “banishing” emotion and distress at an individual level, her remit has been to “manage meaning and complexity, understand emotional life at both an organisational and individual level, and create spaces in which the unique challenges of healthcare work could be observed and understood.” Some remit. The strength of Wren’s book lies in her first-hand account of setting up this therapeutic space – in the form of Schwartz Rounds. Originating in America, they consist of a monthly meeting of health professionals, in a forum that is non-hierarchical and deliberately organisation-wide. Their primary focus is on the human dimensions of providing care. Rather than chasing action-points and outcomes, the emphasis in these meetings is on quiet reflection and stillness – storytelling without a means or an end, where “rational and emotional experience have equal permission to emerge”. Two-thirds of the way through the book, we get to its raison d’etre: a collection of seven stories, garnered from the many Schwartz Rounds that Wren has facilitated. These “true tales” (of the title) illustrate the limitless ways in which a particular story is able to “move”, in all senses of the word. They tell a tale, but they show us a greater truth: that stories “will hold us when nothing else can”. With their beginnings, middles and ends, they can bring order and sense – and “sustain us”. 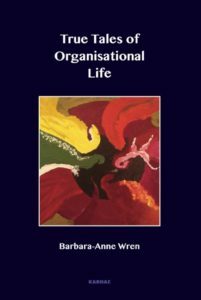 Some of the stories arise from clinical issues, others from tensions that can occur between our personal and professional lives; still more concern conflicts at an organisational level. One of them concerns a “macho” transplant surgeon, who needed to travel to another hospital in order to harvest an organ, before returning gung-ho, aware only of “the happy anticipation of the expectant, hopeful patient” whose life he would be saving – and “ready to demonstrate his skill and authority”. As the successful retrieval surgery came to an end, and the surgical drapes were removed, there was a rustle of paper below the body of the child donating the organs – and a teddy bear tumbled to the floor. The teddy bear was the very first thing the child had been given when he was born; the paper some pages on which family members had imprinted their hands, so that the child would die “in their arms”. As soon as this was explained to the transplant surgeon, “a ring of steel around his emotions was broken”. By the time of the Schwartz round, the surgeon succeeded (only just) in “gather[ing] up all his energy”, and recounted his experience – including the detail of the teddy bear. Reading this stopped me short. It also brought to mind the words of the American writer, Maya Angelou: “There is no greater agony than bearing an untold story inside you”. The surgeon’s burden had been made lighter by the telling of his tale, while those listening, bearers of this confessional, could respond only with silence. Wren unpacks each of the stories she gives us – in this particular case, reflecting on the challenge for clinicians of balancing feelings of sadness and grief with “the business of living”. We need to know, in order to function for the good of all of our patients, when to block each of them out. Both feelings are, of course, essential. Another tale looks at the case of an abusive patient – but from the perspective of the staff looking after her. As Wren points out, the focus of the Schwartz Round is more on effects than causes: here, the focus was on the impact of the abuse on the individual staff members, and the “reality of what they have to withstand”. Faced with this situation, we can sometimes summon up compassion and creativity; at other times, we’re all too aware of the limits of our compassion. But Wren gets the participants to “question the balance between what is being required of them, what they have left to give, and the containment and support they are being offered” – while appreciating, and exploring, the ways within the group of dealing with such abuse. The book is not without faults. The editing could have been a little tighter. At times, Wren’s prose tends towards the mystical. Elsewhere, her generalisations can seem weak. “Everyone”, she tells us, “wants to be a psychologist, or is one, or knows one”. Her statement, that patients in hospital “[a]ll have families who want them back” seems, sadly, a tall tale.